With a fresh dumping of snow, it's starting to feel a lot like Christmas. It's a good thing I have the perfect collection to share for that feeling. Everyone's favorite Canadian nail polish making sister duo Maddy and Krystyn from Beyond the Nail have come up with a super fun Christmas collection inspired by the Ghosts of Christmas. A Very Spooky Christmas is available now and if you purchase the entire collection at a discounted price of $63 CAD, you will also receive their New Year's Eve polish 3, 2, 1 for free! This collection is broken into two categories, if you will. First, there are three flakie top coats and three Christmas Ghost holo polishes. Let's look at the flakies first! These will be $11.00 CDN each or you can grab all 3 for $30.00 CDN. Beyond the Nail Lady in Red is a glimmering and fiery topcoat packed with flakies that shimmer red. Inspired by the elegantly dressed Lady in Red spirit often seen on the 14th floor of the Hotel Vancouver in Vancouver, BC. I chose to wear this over Essie Gel Couture V.I.Please. I used two coats plus top coat. These flakes look like they're on fire in certain lighting. It's a really cool effect and I loved it paired with the magenta creme. You could build this topper up with a third coat and it wouldn't get too thick if you want even more flakies. Beyond the Nail Lady in White is a wild and spooky topcoat packed with flakies that shimmer the colours of the rainbow. Inspired by the White Lady ghost of Montmorency Falls, QC, the spirit of a young woman who tragically ended her life after her fiance was killed in battle. She died wearing her beautiful wedding dress. I had to pair this over a white creme because I love an ethereal look and I wanted it to look like a wedding dress, like the ghost wears. Spooky! This is two coats of Lady in White with top coat. This one is so stunning with the rainbow the flakes give off. So lovely and ethereal. Ghostly, even! Beyond the Nail Blue Lady is a shimmering topcoat packed with flakies that shimmer blue, reminiscent of icicles shining in the morning sun. Inspired by the Blue Lady, the spirit of a young woman who haunts Hilton Head, South Carolina. She was the daughter of the lighthouse keeper, and tragically ended her life after finding her father dead in the lighthouse after a raging storm. I am wearing Lady in Blue over OPI Incognito in Sausalito which is one of my favorite navy blues. This is two coats plus top coat. I love this one too! It is very icy and there is a definite blue glow that I love so much. I really loved this pairing. 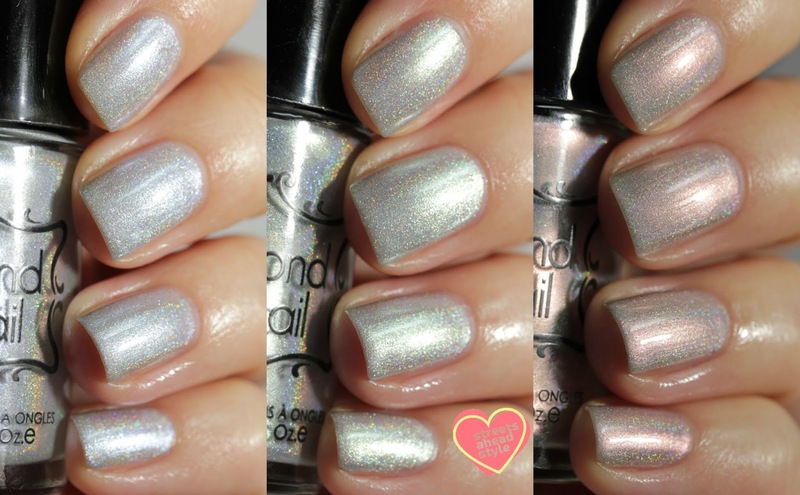 Okay, onto the Christmas Ghost holos which are also ghostly, ethereal and so pretty. The holos are $12.00 CDN each, or all 3 for $33.00 CDN. Beyond the Nail Ghost of Christmas Past is a silvery holographic polish that has a ghostly red shimmer that will remind you of your favourite holiday memories. I really love this one because the red shimmer is so delicate and soft. The formula on these holos is fantastic! It was quick-drying and applied really easily. I used three thin coats plus top coat for a perfect finish. These are super holo and the shimmer payoff is excellent. Beyond the Nail Ghost of Christmas Present is a silvery holographic polish has a ghostly blue shimmer that will remind you how thankful you are this holiday season. Another stunner that applied perfectly in three thin coats plus top coat. This is the blue sister in the trio and it's gorgeous as well. The shimmer payoff is excellent and the holo really sparkles. And finally we have Beyond the Nail Ghost of Christmas Future, which is a silvery holographic polish that has a ghostly green shimmer that will leave you dreaming of delightful holiday seasons to come. You guessed it, three thin coats and top coat. Perfect, quick dry formula with so much holo sparkle and shimmer. What a stunning trio! And for those who are curious to see the polishes side-by-side... I have them below with Present (index), Future (middle) and Past (ring and pinky).